A simple and reliable both spectrophotometric (UV, First- and Second- Order Derivative) and chromatographic [high-performance liquid chromatography (HPLC) coupled with photodiode array (DAD)] methods were developed for determination of α-tocopherol (α-T). 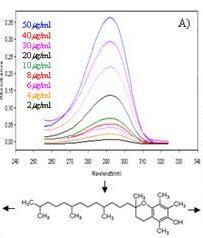 These methods were validated and then were applied to pharmaceutical capsule containing α-T. Spectrophotometrically, α-T was determined by means of UV (A) absorbance values were measured at 292 nm. First-derivative (1D) values were measured at 279 nm and 303 nm. Second-derivative (2D) values measured at 299 nm and 308 nm. Chromatographically, determination of α-T was achieved with methanol-acetonitrile-water (84.5:10:5.5, v/v/v) as mobile phase, a reversed phase C18 column and DAD detection at 292 nm. The spectrophotometric and chromatographic methods used for α-T quantification showed linearity for concentration range of 2-50 µg/mL and 0.5-20 µg/mL with quite high correlation coefficient. Although the LOD and LOQ values for three derivative spectrophotometric methods were lower than HPLC-DAD method, all of the other validation parameters of proposed methods are in acceptable range with similar and favorable results. All of the developed and validated methods were successfully applied for determination of α-T in pharmaceutical capsule which do not require any preliminary separation or pretreatment of the samples. The best results were obtained at A292, 1D303 and 2D299 wavelengths of A, 1D and 2D spectrophotometric methods. Both Cu(II)-neocuproine method in literature and developed HPLC-DAD method were statistically compared and we found that there is no significant difference between the methods (p>0.05).